I showed my “Stoolball Wicket In A Bag” at the AGM. I have used plastic drainpipe. Here are three photos. I have plans for the Mk2 version which should be available in a week or two. This has been a landmark year for stoolball, with three England matches including firsts for the Under-21 and Over-50 ladies teams. In our new video England captains Sue Targett and Gill Hemsley, players from both sides and Stoolball England’s John and Kay Price and Shirley Reed reflect on what has been achieved, and what’s still to come. 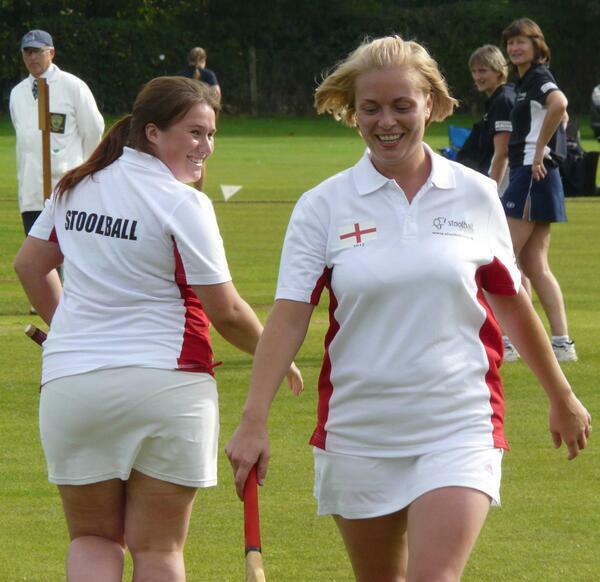 The 34th Annual General Meeting of Stoolball England will be held in the Renshaw Room at Wivelsfield Village Hall, Eastern Road, Wivesfield, West Sussex, RH17 7QQ on Sunday 24 November 2013 at 11am. Please notify all your league or association members of this date. Any league, association or club which is a member may attend this meeting, but only Stoolball England officers, Vice-Presidents and one representative from each affiliated body are entitled to vote. Please note: The name of any member being nominated to become a Stoolball England Officer or a Vice-President should be submitted to me in writing 10 days before the meeting. Nominations will not be taken from the floor. Refreshments will be available from 10.15am for everyone and I look forward to welcoming you to what I hope will be an informative as well as social occasion. Please make every effort to come to the AGM. However, if for any reason you are not able to attend and cannot send a deputy, please contact me by telephone or in writing before the meeting. It is important for the wellbeing of the game that those of you who are involved in the organisation and structure of stoolball attend this meeting to express your views. I look forward to seeing you there. The Management Committee of Stoolball England met at 53 Kings Road, Horsham, on Monday 21 October 2013 at 7.45pm. The meeting included a presentation from James Gardiner, SKiL (Springing Kids into Life) CIC. Topics discussed included club accreditation, England Ladies matches, heritage project, stoolball academy, community events, Women’s Sports Net, Midhurst-Rother College coaching, Small Awards funding and Safeguarding course. Sophie Dunn (South Park Stoolball Club and President’s XI Under-21s) has reached the final 10 in a Young Sports Star of the Year award, but now she needs your help. To reach the final she needs public votes. To support Sophie and help spread the word about stoolball text SU SPORT 2006 followed by your name, house number and postcode to 65100. Calls cost 50p plus one standard network rate. The closing date is Sunday 17 November 2013. With all the wonderful magic of modern media, we are sure there are much slicker ways of saying “thank you” to all the people who have worked so hard to help stoolball and stoolballers enjoy the last three weekends of England training and matches at the beautiful Horsham Cricket club ground. We were blessed with pretty good weather and in all three groups of matches, Under 21s, over 50s and the full England squad, we witnessed some exciting performances. Much time, energy and effort from a large number of people was required to make it all happen. Quite unashamedly we record below the names of all those who contributed to the success of the three weekends and sincerely hope that we haven’t forgotten anyone. Becky Steptowe (76) and Sandra Gorringe (86*) starred with the bat and Amanda Curry (7/16) and Lucy Order (5/40) with the ball as a strong President’s XI side recorded their first win against England at Horsham Cricket Club on 29 September 2013. Captain Sue Targett stood out among the England bowlers taking 6/42 in the match, but England were dismissed for just 61 in the first innings, over 100 behind, and were unable to recover. England Ladies play the Stoolball England President’s XI in only the second match of its kind on Sunday 29 September at 11am. Come to Horsham Cricket Club if you can to cheer them on! Entry is free. You can follow @Stoolball on Twitter or Like our Facebook page for updates during the day. Photos from the day’s play will be posted later on Facebook, and we’ll have the full scorecards here on the website later this week. Good luck to both teams! In the first ever match at Under 21 level, the England team posted a respectable score of 150 against the President’s XI at Horsham Cricket Club on Sunday 22 September. Under heavy skies, Jenny Grout (Surrey) and Hayleigh Gorringe (Sussex) gave the England team a steady start as they put on 45 for the first wicket. With wickets falling steadily thereafter, it was the middle order England batsmen led by skipper Zoe Parsons (32), Lily Bravo (18) and Donna Cottingham (15) who saw them through to their final total of 150. Jodie Rushin (3-26), Rebecca French (3-36) and Georgina Harrison (2-21) were the pick of the President’s bowlers. In response, the bowling by England’s Kim Brown (4-15) and Jenny Grout (3-14) proved too much for the President’s XI. Backed up by some excellent fielding with one running catch by Jamine Rushin being quite brilliant, the President’s team were all out for 81 with only skipper Jess Dean from Horsham (18) offering any real resistance.